A university-sponsored forage program helps cattle producers lower costs, increase profits. You can buy a charger and poly wire and step-in posts for $300 to $400. Hay is a good thing. You’d be hard-pressed to find a cattle producer who will turn it down. But when it is overused in an operation rather than used as a supplement, it can make the breakeven look pretty dismal. That’s why in 2008, University of Arkansas Extension animal scientists developed the 300 Days of Grazing program to increase the time the state’s cattle spend grazing. Mission accomplished. 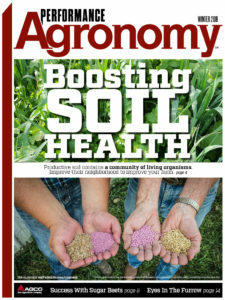 By the spring of 2012, 110 Arkansas producers had enrolled and saved an estimated $200,000 by implementing the practices encouraged in the program. The centerpiece is improved grazing management. 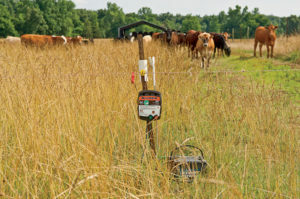 Eddie Prince, a Pocahontas, Ark., cattleman, along with his brother and nephew, actually got a head start by implementing their intensive rotational grazing system in November of 2007. But with County Agent Mike Andrews’ encouragement, they hoped to improve their performance even more and enrolled as a demo farm for the 300 Days of Grazing program. Prince jumped into his intensive rotational grazing system at about the time he was converting his cow/calf operation to a stocker enterprise. Previously, he had his 600 acres of fescue and bermudagrass divided into four or five pastures with permanent fences. He rotated his cattle as they grazed down a pasture. Now, he uses step-in posts and poly wire to portion off what the 250 head of stocker cattle can eat in a day or 2 days at the most. Usually, that is around an acre and a half of forage. The increase is due in part to the fact that cattle graze the forage more evenly. When they are kept in a bigger pasture, the cattle tend to graze heavily around water sources and shade, and typically don’t get to the forage in the back corners of the pastures. The forage specialist explains, “The number one thing it does is help extend the grazing season because of the higher utilization of the forages produced. Number two, it is a good drought management tool. It allows the producer to protect the forage he’s already produced.” It does so by keeping forage from getting damaged under hoof, as Prince notes, and from being eaten too close to the ground where roots could be damaged. It is working. Andrews says they have met their goal of 300 days of grazing on Prince’s operation every year but one, and that was because they ran out of water in one area, not because they ran out of grass. And they haven’t exactly had ideal winters. Think record-breaking ice and snow, floods and drought. To add even more of a good thing, Jennings spearheaded a clover demo at Prince’s farm as part of the 300 Days of Grazing program. Prince seeded a third of his pasture acres with Patriot clover in strips. But, at Jennings’ suggestion, he used three times the normal seeding rate. Then, as the clover matured and went to seed, he let the cattle spread it as he moved them though their temporary paddocks and/or they went back and forth to water. “It took a season and a half or two seasons, but it worked pretty well,” says Prince. 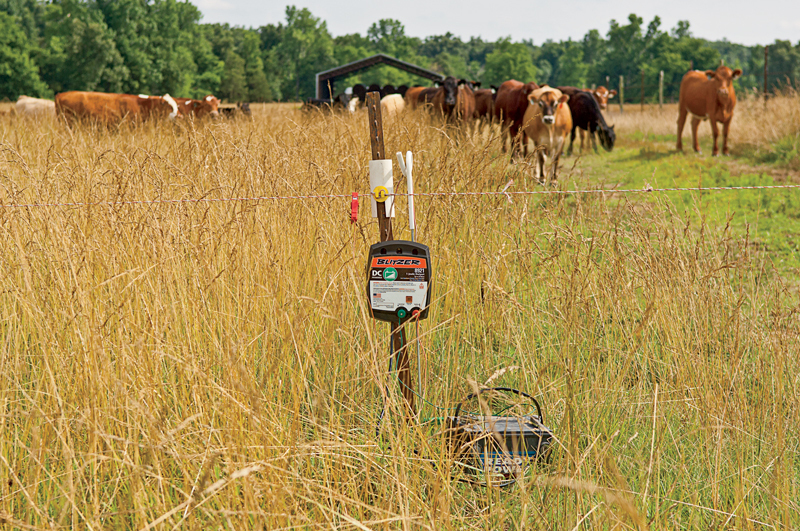 If you’re already using rotational grazing, there are other ways of making your operation more efficient. Although Prince was one of the three whole-farm demonstrations in the 300 Days of Grazing program, the other producers could choose from one of eight forage-based categories. The first, of course, is improving grazing efficiency with rotational or strip grazing. That still leaves stockpiling fescue, stockpiling bermudagrass, incorporating legumes, using winter annuals, using summer annuals, reducing hay waste during storage and reducing hay waste during feeding. Whether you live in Arkansas or California, Prince advises that you give one or more of these strategies a try. After all, he and 100-plus other producers agree that your bottom line will be the better for it.